Publisher: EA. Developer: Eden Studios. 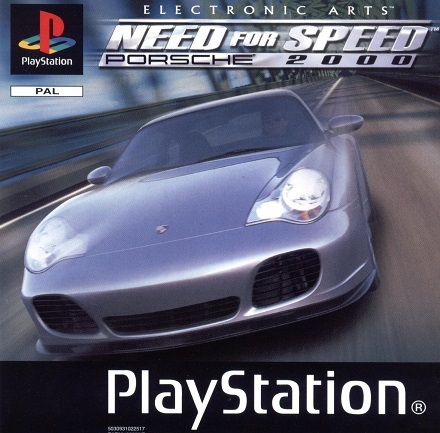 Though Need For Speed had done well for EA throughout the mid and late nineties, the popular consensus was that that it was going to have to grow into a more complete racer in order to compete with the TOCA’s, Ridge Racer’s and Gran Turismo’s that had screamed their way into the gaming conscience, and by the turn of the millennium, they were threatening to do doughnuts on NFS’s legacy. EA recognised the danger however, and began transitioning the series to better accentuate the longevity and real-racing feel of its rivals, enlisting the talented Eden Studios (who developed the V-Rally titles) to create the mostly-terrific fifth entry in the series, Porsche 2000. EA had bagged themselves a golden racing licence in Porsche (with exclusivity passing from Sony’s Porsche Challenge to the NFS games at the conspicuous expense of Gran Turismo), and to their credit, they ensured extensive and reverent use of the property. The game is resplendent in dynamic Porsche loading screens, showroom-esque car displays and a fantastic range of cars that spans fifty years, from the 355 and 550 Spyder, to the instantly-recognisable Boxster and 911 Carrera variants, as well full-blooded racers that include the scarily fast Le Mans supercars. It’s clear from the stat-packed, menu-heavy suit ‘n’ tie approach that Eden took a leaf or two from the Gran Turismo school of driving, and for a development house more versed in arcade-style racers, the end result is impressive. Though it’s not as deep or as polished as Polyphony’s racing kingpin, Porsche 2000 deserves considerable credit for putting its own spin on simulation formulas. The Factory Driver mode in particular is brilliant; it may evoke comparisons with the rather stressful licence tests that had been hastily assimilated into all games of the time that wanted to be seen as ‘real racers’, but it’s a lot more compelling than you’d think. Starting out as an unknown, your task is to complete a series of timed challenges, with the ultimate goal of becoming Porsche’s main test driver. This typically sees you slaloming around cone formations trying to complete a course within a strict time-limit. The difficulty is exceptionally gauged; no trial is doable at the first attempt, though none of them ever feel insurmountable either, and as a consequence the mode becomes an absorbing, moreish challenge. Spanning just the twelve missions, it’s regrettably brief, but the added bonus of unlockable cars along the way make what is a nice distraction that bit sweeter. Video Showcase! Eat your heart out, Gran Turismo. Evolution is where the long-term play lies, and it’s a cool setup that moves through what are deemed Classic, Golden and Modern eras for the Porsche brand, with their own corresponding races and cars. At the hub of each era are multi-race tournaments, which particularly towards the latter stages of the game, become fascinating balancing acts as the increasingly hefty costs of repair can lead to the player having to nurse a damaged vehicle. Do you risk going all-in on engine repairs and pray that spongy brakes don’t let you down? Can the body survive as tinfoil if you sturdy up the suspension? Elsewhere there are Weekend races that encourage the use of a full repertoire of Porsches by providing model-specific races, and Circuit races that, as the name suggests, sees you using racing models on tracks. These two modes feature markedly tougher alternatives to the tournaments, with the A.I. ferociously quick in Weekend and the cars monstrously fast and tough to control in the Circuit racers. Interestingly, there are some fantastic modes that have been limited to the Quick Races menu, presumably to maintain the game’s focus on simulation. The Chase mode is the best, and it’s classic Need For Speed; it’s player versus cop with the aim of outrunning and evading them for 90 seconds. It isn’t until you play Chase that you appreciate how far-reaching the design of each location is, as they feel like open-world locations unto themselves. Porsche 2000 does look a little rough around the edges, though the lack of visual polish is in marked contrast to its design quality. Tracks are afflicted by a considerable amount of pop-up, with rickety buildings and textures that look decidedly wobbly. But there’s plenty of detail to the settings; Scotland is punctuated by seaside villages and long, looping rural roads, whilst the more-urban Japan feels busy, cramped for space and littered with hazardous tight corners and shortcuts through industrial complexes. France’s Riviera course allows you to rocket down the seafront and picturesque streets with the odd roundabout thrown into the mix for good measure. More importantly though, the racing itself runs soundly. The handling takes a little getting used to but is weighty enough and challenging enough to make for strong playing experience, whilst the action maintains a consistent frame-rate and rarely succumbs to slowdown. That said, the field of competitors is conspicuously modest, with the majority of races seeing only three opponents lining up alongside you on the grid. The damage model is really impressive, with each Porsche crumpling gradually and extensively upon accumulating prangs. There is the odd teething issue, such as the completely rubbish ‘reset to track’ function that typically respawns you facing the wall or lamp post you’ve just hit, and cars have been known to get stuck in walls and tire barriers after colliding with them, which understandably puts a bit of a dampener on your chances. The two-player is acceptable and helped by a strong mix of one-on-one scenarios, but it’s way short of TOCA 2’s and Wip3out’s respective multiplayer suits, with their involved tournaments and numerous A.I. competitors for company. There are PSone racers that offer better racing, physics, graphics and lifespan than Porsche 2000, yet as a whole it’s an impressive package, and one that Porsche fans are unlikely to be left disappointed with. Offering a stern challenge, enjoyable and fast-paced racing as well as some far-reaching and underappreciated environment design, Eden Studios have crafted another strong racer, and one that was ultimately instrumental in prolonging the Need For Speed brand.